The MAE Center develops research methods and tools to support Consequence-based Risk Management, or CRM. Consequence-based Risk Management is a new paradigm for seismic risk reduction across regions or systems that incorporates identification of uncertainty in all components of seismic risk modeling and quantifies the risk to societal systems and subsystems. Located on the University of Illinois, Urbana-Champaign campus in the Department of Civil Engineering, the MAE Center collaborates with NCSA—the National Center for Supercomputing Applications—a leader in software infrastructure supporting scientific and engineering research. MAEViz development is supported by the MAE Center through the Earthquake Engineering Research Centers Program of the National Science Foundation under NSF Award No. EEC-9701785. MAEViz is an open-source project that helps reduce the time from discovery gap that exists between researchers, practitioners, and decision makers by integrating the latest research findings, most accurate data, and new methodologies into a single software product. 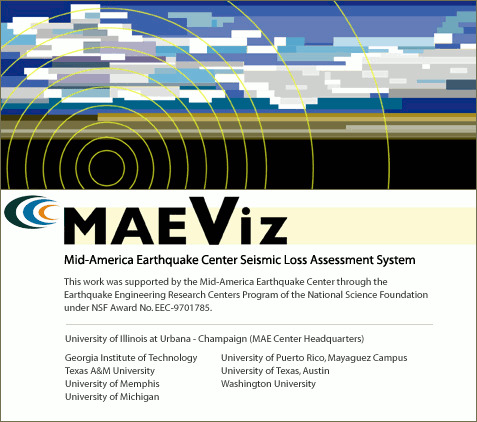 MAEViz is a joint effort between the MAE Center and the National Center for Supercomputing Applications (NCSA) to develop the next generation of seismic risk assessment software. MAEViz is leveraging off NCSA's cyberenvironment efforts and the University of Michigan's Sakai collaboratory to provide an advanced framework for earthquake engineering, as well as general hazard and risk research, harnessing multi-institutional expertise, as well as existing and new tools across a broad range of technologies. The open-source framework of MAEViz employs the latest and most advanced workflow tools to provide a flexible and modular conduit through which the culmination of the interdisciplinary research and development efforts of the MAE Center are integrated and delivered to end-users. 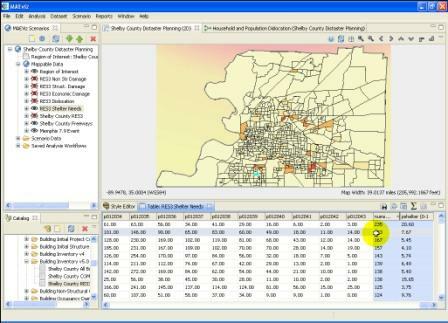 MAEViz follows the Consequence-based Risk Management methodology (as shown at the bottom of this page) using a visually-based, menu-driven system to generate damage estimates from scientific and engineering principles and data, test multiple mitigation strategies, and support modeling efforts to estimate higher level impacts of earthquake hazards, such as impacts on transportation networks, social, or economic systems. It enables policy-makers and decision-makers to ultimately develop risk reduction strategies and implement mitigation actions. 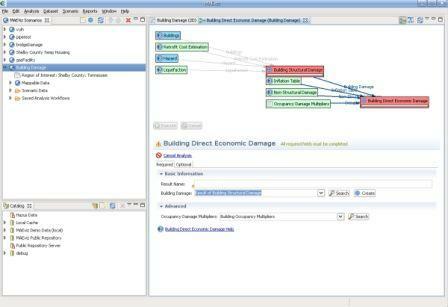 MAEViz is built using modern industry-standard open source tools, and is designed to be quickly and easily extensible. When new science, source data, or methodologies are discovered, these can be quickly added to the system by end users or third party developers, via a plug-in system. This ensures that the newest discoveries can be used in MAEViz at any given time. The extensibility also allows MAEViz to be used for other future scenarios, such as other hazardous events like hurricanes, fires, etc. You can get MAEViz for Windows from our MAEViz download page. Daily builds, which have all the latest features, but are more likely to have bugs or problems, are available from the above website. The MAEViz development team only officially supports the Windows version of MAEViz. We do make builds for Linux and Mac in our daily builds, which can be used. View the latest screencasts and presentations at MAEViz Presentations and Demonstrations.